Located in Huntsville, ABC Overhead Garage Doors has been proudly serving you since 1999. 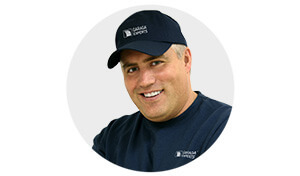 Our team is dedicated to providing you with exceptional garage door sales and services. Our commitment to quality workmanship has earned us a reputation as leaders in the industry. Since both quality and price are important to us, we carry a wide range of residential and commercial overhead doors manufactured by Garaga. We believe Garaga garage doors are the perfect balance of quality materials and pleasing design. Please visit our garage door gallery to see all of our beautiful models. The best way to experience what we have to offer is to visit our showroom. Our team can show you which door styles, colours, windows and hardware best suit your home. Come make your vision a reality! We are located at 114 Lindgren Road West, Unit #1, Huntsville, Ontario. No time to visit? Complete our free online quotation form or call us at 705-990-5403 to book a consultation. We’re looking forward to serving you! Did you know the average garage door weighs over 150 pounds and covers up to 40 percent of your home’s facade? Don’t risk injuring yourself – let an electric garage door opener do the heavy lifting for you. Our technicians can safely install an opener to your new or existing garage door. At ABC Overhead Garage Doors, we recommend LiftMaster brand door openers to all of our customers. Manufactured by the Chamberlain Group Inc., these electric openers are built to operate quietly, letting you use your overhead door without disturbing your family. LiftMaster door openers come equipped with the latest safety features and technology to best serve your individual needs. To learn more about our selection of electric door openers, please visit our online gallery. There, you can learn about our many residential and commercial products and available accessories. You may also visit our showroom, where our team can help you choose the right opener for your home or business. At ABC Overhead Garage Doors, we understand the importance of a professional garage door installation, repair or maintenance. That’s why our team of technicians are certified Garaga Experts. Our work will always be done according to the most rigorous safety standards. We pride ourselves in providing outstanding service to all of our customers. In need of emergency repairs? Call us at 705-990-5403 for 24-hour emergency service. We’ll send one of our qualified technicians right away. To avoid costly garage door malfunctions, our team also offers preventative maintenance programs. We’ll keep your residential or commercial overhead door and door opener in great working condition. Let us show you why ABC Overhead Garage Doors is “A Better Choice”. Visit our showroom to see our wide range of products or call us to book an appointment. We serve Huntsville, ON and surrounding district, including Bracebridge, Gravenhurst, Magnetawan, Parry Sound, Muskoka, Burk's Fall, Dorset, Rosseau, Bala, Emsdale, Dwight, Baysville, Port Sydney, MacTier, Port Carling and more. Huntsville, Bracebridge, Gravenhurst, Magnetewan, Muskoka, Parry Sound, Burk's Falls, Dorset, Rosseau, Bala, Emsdale, Dwight, Baysville, Port Sydney, MacTier, Port Carling.